But the final was marred by some unsavoury scenes after the final whistle with fans seen fighting on the field following a pitch invasion. Anthony Stokes celebrates his early goal. ANTHONY STOKES MAY be wearing the green of Hibs today but the Ireland striker, who is on-loan from Celtic, will no doubt have cheered his employers with a crucial double in the Scottish Cup final against Rangers. Dubliner Stokes opened the scoring after just four minutes, finishing well after collecting a pass from Jason Cummings on the left wing. But Celtic’s Old Firm rivals responded well through goals from the evergreen Kenny Miller and Andrew Halliday to put the Glasgow side in pole position to lift the cup with 30 minutes to play. But Rangers were undone by two late Liam Henderson corners, the first of which was headed home by Stokes in the 80th minute, and the second one, 10 minutes later, which was converted by captain David Gray. It’s the first time Hibs, who also had Donegal’s Conrad Logan in goal, have won the Scottish Cup since 1902. A pitch invasion followed the final whistle with fights breaking out between rival fans on the field, leaving a sour taste on a momentous day for the club. Email “Stokes on the double as Hibs stun Rangers to win Scottish Cup”. 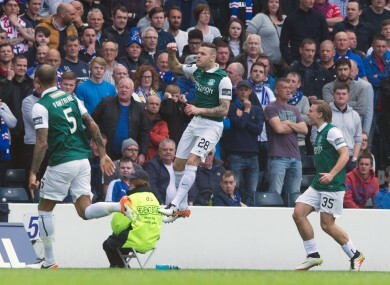 Feedback on “Stokes on the double as Hibs stun Rangers to win Scottish Cup”.